** We're sorry but canceled due to rain. 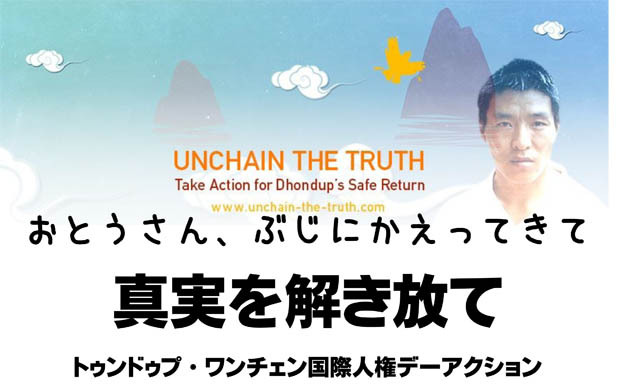 After more than six years of prison, Dhondup Wangchen is finally going to be released from prison on 5 June 2014. SFT Japan holds an event, filming "Jigdrel - Leaving Fear Behind" under the sky in Tokyo. Please welcome. Place: Daishido Temple, Gokokuji - 5 min walk from Gokokuji station, Yurakucho metro line. Tibet support groups of Japan have sent a joint statement to Japanese Prime Minister Naoto Kan and Foreign Minister Takeaki Matsumoto that condemns the Chinese government's oppression of Tibetans in Ngaba county. The letter is based on the original letter from HH The Dalai Lama, statements from HRW, a report from TCHRD and the five NGO's earlier press release. I take this liberty, on behalf of Tibetan people, to express my deep sadness over the unimaginable disasters the people of Japan were struck on the 11th March. Such a ravaging nature razing Minamisanriku city beyond recognition is so heartbreaking to see. I am confident that Japan will overcome this natural calamity soon, and will once again outshine as ever and the people who witness the loss of their properties and loved ones shall overcome their sorrow and suffering as well. I also pray the nuclear reactor leakages bring no further human catastrophe. Tibetan people all over the world are praying for Japan at this time. As far as my knowledge is concerned there is a mass prayer gathering at Japanese Monastery in New Delhi organized by South Delhi Tibetan Association today. I also heard that there will be a prayer gathering organized by Tibetan Community of Japan at Gukokoji temple on the 19th March from 1 to 4 pm in Tokyo. We also prayed here in Dharamsala. These acts of solidarity with the people of Japan are not a symbolic gesture but one that shows the deepest of our feelings at this time of difficult the people of Japan has to undergo. I believe this earthquake and the tsunami are by far the most dreadful in the last 40 years of Japan's history. We pray such scale of natural disaster will not ever occur again in Japan or on this earth. We're shocked and saddened by the tragedy that struck Japan. It is terrifying to see some of the pictures and video of the earthquake and tsunami that have hit Japan in the last couple of days, and naturally all of us have been feeling very worried about you. I hope that all of you are somehow doing ok and recovering from the shock. We are sending our condolences and prayers for all the people in Japan who've lost their lives in this natural disaster. We will arrange prayers in Dharamsala too at the main temple of His Holiness the Dalai Lama. Please stay careful and let us know if there is anything we can do at this difficult time. SFT Japan will be working with Kawachen to present short introductory classes on Tibetan writing (the same that were done at Feel Tibet). The other Tibet support groups will also be having events and displays based on their particular areas of speciality. Please come out and join us for this event to promote awareness of the Tibet problem and Tibetan culture. On April 8th, China sentenced two Tibetans, Lobsang Gyaltsen and Loyak, to death for their alleged involvement in last year's protests in Lhasa. Read more about their plight. Tendor joined SFT's staff in 2004 after one year as a member of SFT's Board of Directors and many before that as the SFT chapter leader at Brown University. His reason for being involved with SFT? "It allows me to be young, mad, angry, powerful, nonviolent and effective at the same time." He recently left the Grassroots Coordinator position and became SFT's Deputy Director. Tendor is well regarded by the younger generation of Tibetan refugees as an activist and voice for Tibetans. Often speaking to the media, heads of state, and various organizations, Tendor's visit this year should prove to be highlight for activists in Japan. Finished April 3rd, 2009 - Students, we need your support! SFT Japan is looking to coordinate with students and student groups during the visit of SFT's Tenzin Dorjee (Tendor) to Japan from May 7th to the 13th. Would your organization or school like to hear from an activist who started out doing grassroots work at his university (Brown University), then moved on to full time activist work? For all those interested, please mail moc.liamg|8002napajtfs#moc.liamg_ta_8002napajtfs (both English and Japanese is OK). While we will do our best to accommodate eveyone, please understand that scheduling conflicts may make some dates and times impossible. Because of this the South African peace conference for Nobel laureates has been postponed indefinitely. Despite being completely peaceful and only wishing to engage the Chinese government in discussions, SFT Japan regrets the fact that a meeting with the purpose of peace has been postponed due to Chinese pressure. Please join us in writing to the South African embassy to request that the Dalai Lama be allowed to enter to attend this important meeting. The Tibetan Government-in-Exile has released rare footage smuggled out of Tibet that confirms Chinese forces used extreme violence against Tibetans following the March 2008 protests. Coinciding with Earth Day on April 22nd, SFT Japan will have a booth at the largest public earth festival in Japan, Earth Day Tokyo 2009. While there are often various Tibet support groups participating, this year will be a first for SFT Japan. Please come by and see us on the weekend at Yoyogi park.